When George W. Bush spoke of planting the ‘seeds of democracy’ few realized he might have had in mind Monsanto seeds. Despite nominal national elections earlier this year, control over the Iraqi economy is still run out of the Pentagon. In May 2003 Paul Bremer III, was put in charge with the imposing title, Administrator, of a newly created Coalition Provisional Authority or CPA. Bremer, a former US State Department terrorism official, had gone on to become a Managing Director of the powerful consulting firm of the former Secretary of State, Henry Kissinger’s Kissinger Associates. As head of the CPA, Bremer moved swiftly to draft a series of laws to govern Iraq, which at the time had no constitution, nor legally-constituted government. The new laws of the US occupation authority numbered 100 in all, and were put into effect in April 2004. One of the Orders mandates that no elected Iraqi government will have the power to alter the US-imposed laws. The new laws, or Orders, as they were called, would insure that the economy of Iraq would be remade along lines of a US-mandated ‘free-market’ economic model. Bremer’s first act was to fire 500,000 state workers, most of them soldiers, but also doctors, nurses, teachers, publishers, and printers. Next, he opened the country’s borders to unrestricted imports: no tariffs, no duties, no inspections, no taxes. Two weeks after Bremer came to Baghdad in May 2003, he cynically declared Iraq to be ‘open for business.’ Whose business he didn’t say but it soon became clear. CPA Order 37 lowered Iraq’s corporate tax rate from roughly 40 percent to a flat 15 percent. Without tax revenues, the state would be unable to pay a role in anything. Order 39 allowed foreign companies to own 100 percent of Iraqi assets outside of the natural-resource sector. This ensured unrestricted foreign business activities in the country. Investors could also take 100 percent of the profits they made in Iraq out of the country. They would not be required to reinvest and they would not be taxed. The CPA explicitly defined the legal importance of the 100 Orders to leave no doubt that they were, indeed, orders. An Order was defined as, ‘binding instructions or directives to the Iraqi people that create penal consequences or have a direct bearing on the way Iraqis are regulated, including changes to Iraqi law.’ In other words, Iraqis were told, ‘do it or die.’ The law of occupation was supreme. Buried deep among the Bremer laws was Order 81, ‘Patent, Industrial Design, Undisclosed Information, Integrated Circuits and Plant Variety Law’. In plain English, this gives holders of patents on certain plant varieties, i.e. large foreign multinationals, absolute rights for 20 years over use of their seeds in Iraqi agriculture. The protected plant varieties are Genetically Modified or Gene Manipulated (GM) plants, and an Iraqi farmer who chose to plant such seeds must sign an agreement with the seed company holding the patent that he would pay a ‘technology fee’ and an annual license fee for planting the patented seeds. For years, the Iraqis had held samples of such precious natural seed varieties in a national seed bank, located, ironically, in Abu Ghraib, the city made infamous as a US military torture prison site in 2004. Following the US occupation and various bombing campaigns, the historic and invaluable seed bank in Abu Ghraib vanished, a possible further casualty of the Iraq war. Bremer’s Pentagon advisers had very different plans for Iraq’s food future. Iraqi agriculture was to be ‘modernized,’ industrialized and reoriented away from traditional family multi-crop farming, into US-style agribusiness enterprises, producing for the ‘world market.’ Serving the food security needs of hungry Iraqis would be purely incidental to that plan. The CPA’s Order 81, behind the cover of complicated legal jargon, in effect, turned the food future of Iraq over to global multinational private companies, hardly the liberation most Iraqis had hoped for. It would at first seem that only those seeds which Iraqi farmers chose to buy from international seed companies would fall under the new US-imposed Iraqi law on patents, that farmers were free to choose. The reality was far different. Iraq was being turned into a huge laboratory for development of food products under control of giant GMO seed and chemical giants such as Monsanto, DuPont and Dow. In the aftermath of the 1991 Iraq war and the devastation, Iraqi farmers most often turned to their government Agriculture Ministry for new seeds if they were to plant. Here was the open door for Bremer’s insidious takeover of the future Iraqi food supply. Iraqi farmers had endured not only the embargo of needed agriculture equipment during the years of US-UK-led embargo. Iraq had also endured three years of severe drought prior to the 2003 war, a climate misfortune which caused Iraqi wheat crops to decline severely. Years of war and economic embargo had devastated Iraqi agriculture, and by 2003 grain production had fallen to less than half the level of 1990 before the first Iraq-US war. Much of the Iraqi population had depended on UN oil-for-food food rations to survive up to 2003. The US State Department AID and the US Agricultural Reconstruction and Development Program for Iraq (ARDI) stepped in after 2003, to transform traditional Iraqi agriculture, all in the declared name of ‘modernizing’ Iraqi food production. The US Government replaced the UN as food supplier. The key Washington agriculture czar for Iraq at that time was Daniel Amstutz, former US Department of Agriculture official and former Vice President of the giant grain conglomerate, Cargill Corporation. Amstutz wrote the US demands on Agriculture during the GATT Uruguay Round which led to creation of the World Trade Organization in the early 1990’s. Order 81’s alleged aim was ‘to ensure good quality seeds in Iraq and to facilitate Iraq’s accession in to the World Trade Organization.’ ‘Good quality’ was to be defined by the US, of course. WTO accession meant Iraq had to open its markets and laws to rules dictated by the WTO and the powerful industrial and financial interests dominating WTO policy, the so-called ‘rich mens’ club. As soon as Order 81 had been issued, USAID began delivering thousands of tons of US-origin ‘high-quality, certified wheat seed” for subsidized, initially near cost-free distribution through the Agriculture Ministry, to desperate Iraqi farmers. The USAID refused to allow independent scientists to determine whether the seed was GMO seed or not. Naturally, should it prove to have been GMO wheat seed, within one or two seasons, Iraqi farmers would find themselves suddenly dependent on paying royalty fees to foreign seed companies to survive. Under the USAID program, the State Department, working with the US Department of Agriculture (USDA) set up 56 ‘wheat extension demonstration sites’ in northern Iraq, ‘introducing and demonstrating the value of improved wheat seeds.’ The project was run for the US Government by Texas A&M University’s International Agriculture Office. This $107 million US AID agriculture reconstruction project had as goal the doubling the production of 30,000 Iraqi farms within the first year. The idea was to convince sceptical Iraqi farmers that only with new US ‘wonder seeds’ could they get large harvest yields. Desperation and a promise of huge gains would be used to trap Iraqi farmers into dependence on foreign seed multinationals. Texas A&M's Agriculture Program describes itself as ‘a recognised world leader in using biotechnology,’ or GMO technology. With their new seeds would come new chemicals – pesticides, herbicides, fungicides, all sold to the Iraqis by corporations such as Monsanto, Cargill and Dow. Iraq was to become a giant live laboratory for testing GMO wheat, and the Iraqis were the human guinea pigs of the experiment. Even more remarkable, reports the Phoenix Business Journal, ‘six kinds of wheat seeds were developed for the Iraqi endeavour. Three will be used for farmers to grow wheat that is made into pasta; three seed strains will be for bread-making.’ That means 50% of the grains being developed by the US in Iraq after 2004 are meant for export. Pasta is a food foreign to the Iraqi diet. Rather than produce food for the starving 25 million war-weary Iraqis, Bremer’s Order 81 was designed to create industrialized agro-business, using GMO seeds for global export. USAID has the aim to get the government out of food production. ‘The idea is to make this completely a free market,’ said Doug Pool, agriculture specialist with the USAID's Office of Iraq Reconstruction. The USAID aim is to ‘help’ the new government phase out farm subsidies. ‘The Minister of Agriculture has been quite good in doing that,’ Pool said. State enterprises, such as the Mesopotamia Seed Co., ‘need to be spun off and privatized,’ he declared. He didn’t mention who would have the cash in war-torn Iraq to buy such a state seed company. Only cash-rich foreign agri-business giants such as Monsanto or Cargill could be likely buyers. Control their seeds and control the food. 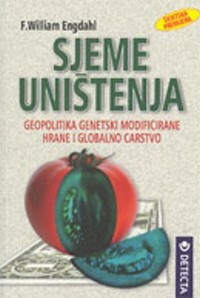 To facilitate the introduction of patent-protected GMO seeds from foreign seed giants, the Iraq Agriculture Ministry distributed the new GMO seeds at ‘subsidized prices.’ Once farmers were hooked on the GMO seeds, under the new Plant Patent Protection rules of Order 81, they would be forced to buy new seeds each year from the company. Under the banner of bringing a ‘free-market’ Iraqi farmers are becoming enslaved to foreign seed multinationals. In a December 2004 interview, Iraq’s US-educated interim Agriculture Minister, Sawsan Ali Magid al-Sharifi, stated, ‘We need Iraqi farmers to be competitive, so we decided to subsidise inputs like pesticides, fertilisers, improved seeds and so on. We cut down on the other subsidies, but we have to become competitive.’2 In other words, money for Iraq’s impoverished farmers to buy new seeds is earmarked for the buying of GMO ‘improved seeds’ from foreign multinationals like Monsanto. 1 Smith, Jeremy, ‘Iraq: Order 81,’ The Ecologist v.35, n.1, 1 Feb. 2005. Coalition Provisional Authority, Order 81. ‘‘Iraq's new patent law: A declaration of war against farmers’, by Focus on the Global South and GRAIN, www.grain.org.